Sugar scrubs are one of the easiest ways to pamper yourself in the convenience of your own home. 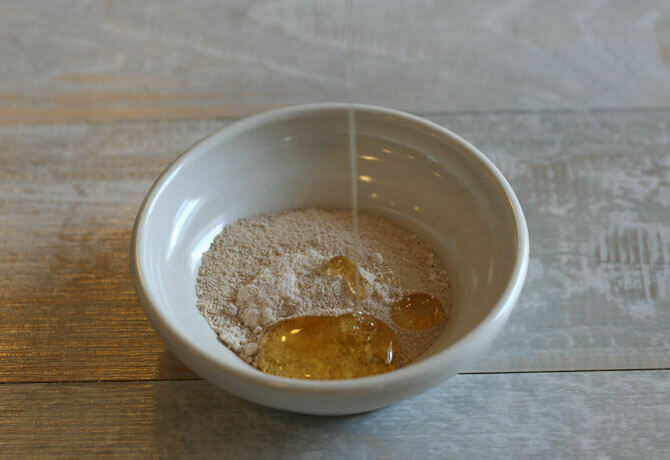 You may have tried some sugar scrub recipes already like this DIY Coconut Coffee Sugar Scrub or this Hydrating Body Scrub. These are awesome body scrub recipes, but today we are going to focus on your face. Face scrubs are great for removing dead skin cells and polishing the skin. They can help reduce red spots and blemishes while softening the skin. As it exfoliates, the face scrub helps to increase circulation and uncover the radiant skin beneath. There are so many options for facial scrub ingredients. It can be exciting coming up with fun, nourishing combinations. But there are a few things to consider before choosing your ingredients. 1. Choose a gentle, fine exfoliator. You don’t want to use a harsh, abrasive exfoliator on your face. These are fine for body scrubs but we need a gentler option for your face. Some examples are finely ground sugars and salts, powdered herbs, and oatmeal. Nothing harsh for the delicate skin on your face. 2. Choose the right carrier oil or base for your facial scrub. Facial scrubs are usually mixed with a carrier oil for easier application and nourishment for your skin. 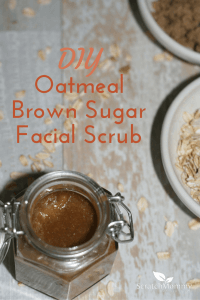 I chose jojoba oil for this facial scrub recipe because it is a great oil for acne prone skin but also extremely moisturizing. The last thing you want your face scrub to do is break you out. If you aren’t prone to breakouts you could swap the jojoba for sweet almond oil, coconut oil, or your favorite carrier oil for your skin. Raw Honey – Honey is AMAZING for your skin! It is gentle enough to cleanse without stripping or drying out your skin. It is ideal for all skin types. If you do suffer from breakouts, Manuka Honey is a little more powerful option to cleanse and help prevent future breakouts. Jojoba Oil – I love jojoba oil. It is a non-greasy oil that closely resembles your own skin’s sebum. It is an awesome option for moisturizing the skin without clogging the pores. Essential Oils – Frankincense, Geranium and Lavender are all known for their healing properties. Frankincense is a great addition to many DIY anti-aging serums and creams because of it’s tightening properties. For most skin types it is beneficial to use a facial scrub 2-3 times per week. Unless you have super sensitive skin, then try once a week and see how your skin reacts. This recipe will be enough for around 3 uses. A facial scrub can be an integral part of an at-home facial pampering. 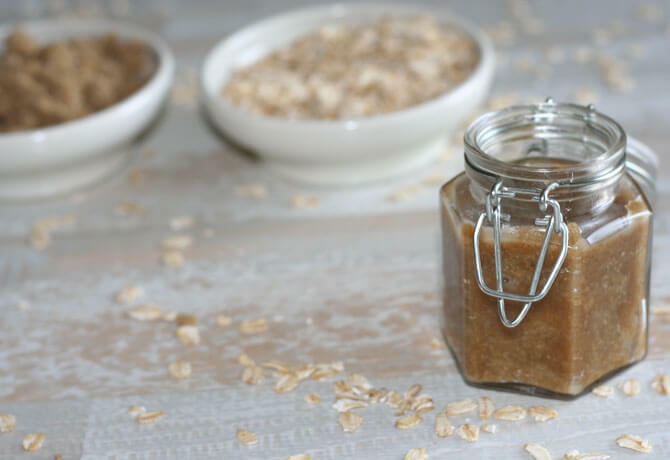 Grind oatmeal and brown sugar into a fine powder using a coffee grinder or blender of your choice. Add the raw honey, jojoba oil and essential oils and stir well. Apply a small amount of facial scrub to your skin and gently massage using small, circular motions for several minutes. For best results, leave facial scrub on your face for 5-10 minutes if you have time. 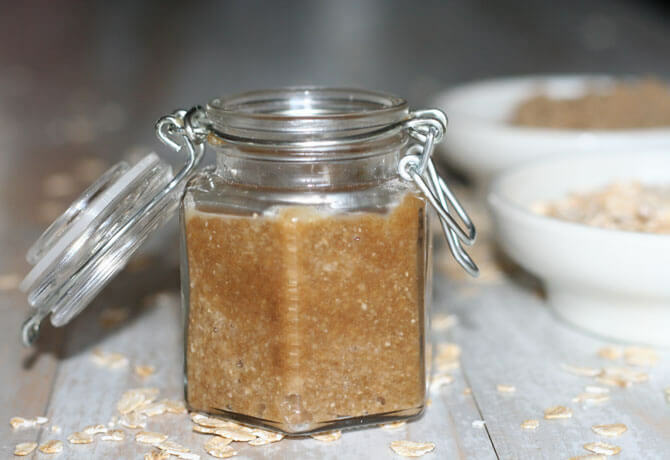 Not feeling particularly DIYish, but want the whole spa scrub experience at home? Check out Scratch Mommy Founder Jess’s lovely Face Scrub in the Pronounce Skincare Shop! How much is “T” table spoon? Thanks for your feedback. Creating DIY skincare products to your own personal liking is always encouraged! And also the honey – half this! Creates a thicker mixture! Hi can I prepare this and use for a month? Hi! Yes, I think you’ll be just fine. Just the recipe I was looking for! Thank you so much ♥️ Quick question on the storage part. What’s the shelf life of this if I choose to make a batch? Fantastic…I’m glad you found the recipe! The way the recipe is written is a really small batch and will be used up pretty quickly, I’d think. Honestly, with the honey (and even adding a few drops of vitamin E), I would have no concerns having this around for a few months. Just make sure that you use clean utensils when DIYing, and always use clean hands when using the mask. Happy DIYing!